To know if the housing market in any given year is improving, you've got to compare activity not only month-over-month but also year-over-year. Real estate markets move in cycles. Sometimes the market is up and sometimes the market dips. The mortgage meltdown of 2007 taught us in a big way that real estate prices do not continually rise. The housing market can crash. That 2007 crisis shattered dreams and threw the housing market into a panic. Through sheer tenacity, I've managed to survive many volatile real estate markets from the past. During the late 1970s, interest rates were 18% and many first-time home buyers were priced out of the market. In the mid-80s, the tax reform act of 1986 had a seriously negative affect on the real estate market. We'll never forget the fall of the housing market that began at the end of summer in 2005. When you hear your neighbor's car pulling out of the garage in the wee hours of the morning after months of no activity, you'll know that your neighbor got a job. When the unemployment rate drops and people return to work, the housing market is recovering. Too many for sale signs in your neighborhood means there are too many homes for sale and generally not enough buyers to buy them. Excess inventory pushes down sales prices. It doesn't matter whether you track home sales by per-square-foot price, average or median prices, when the market is depressed, they all fall. Compare median sales prices this year to median prices last year. Steady increases mean the market is improving. When demand is on the rise, homes sell quickly and the days on market are reduced. A starter home that is attractively priced in good condition and a desirable location should typically sell within 30 to 60 days. Little shows more faith in a budding economy than when entrepreneurs strike out and open a new neighborhood business. When you spot the boards coming off of a closed up shop and a new sign goes on the building, it means a recovery is underway. 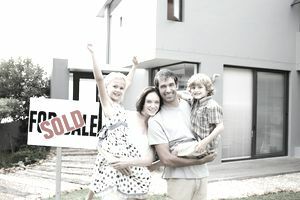 When you no longer have to ask if the home for sale is a foreclosure or a short sale, the market is turning around. When traditional sellers feel the market is stable enough, they will put their homes on the market because those sellers will have equity. In down real estate markets, real estate agents tend to leave the business in droves and real estate companies downsize. When business is improving, real estate companies expand and hire more agents because their phones are ringing with Floor calls from buyers. When financing is scarce, the cost of lending that money goes up. When plenty of money is available to lend, interest rates fall. Lower interest rates equal a higher purchasing power for buyers and stimulate the housing market. The National Association of REALTORS' Housing Affordability Index tracks the percentage of buyers who can afford to buy a home. The higher the percentage, the lower the income that is required to qualify for a mortgage. During troubled times, typically the only sellers who sell a home are those who must due to circumstances beyond their control such as a job transfer, divorce or they can't afford to make their mortgage payment. Many of those sellers do not buy another home. The move-up market becomes stagnant. In a more balanced market, it's not only a good time to sell but also a good time to buy a home.